99 Percent Mine follows Darcy Barrett, a bartender and world traveler. When she and her twin brother, Jamie, inherit their grandmother’s cottage, they need their childhood best friend, Tom, to help with renovations. Darcy has known for years that Tom was the most perfect man, but his girlfriend-turned-fiance and friendship with her brother always kept her away. However, when situations change and he surprises her on her porch to begin renovations, Darcy decides to make him hers. Sally Thorne has a gift for funny, swoon-worthy, and adorable writing. After The Hating Game, she has become one of my favorite romance writers, and 99 Percent Mine only proves that she didn’t just get lucky with her first book. The banter in this book is full of both heat and humor. This book doesn’t quite have the magic of The Hating Game,but it comes pretty close. The plot is interesting, full of drama and angst to keep turning the pages. The pace is fast, making it easy to read in one sitting. 50 pages fly by in a blink. Sometimes the pacing would feel a little awkward, but it doesn’t take away from how fun this book is. The characters are probably where this book suffered the most. Darcy is a very unique character, and it took me a while to start liking her. She’s badass, unapologetic, quirky and loves putting people in her face. She’s straight-forward to the point of aggressive, and it definitely takes some getting used to. That said, by the end of the book I did like her. Just give her some time. Tom, on the other hand, is much more likable. He has his flaws, but overall he’s just a great guy who works hard to meet the impossible standards placed on him. The one major thing I wasn’t a fan of– both with him and Darcy– was their jealousy and possessiveness. It was a major part of the book, and while usually, I can tolerate it to a degree, it’s one trope I can’t really get behind. Pros- Cute, funny, and lighthearted! Great writing! 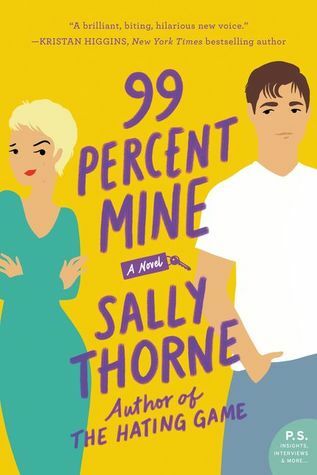 99 Percent Mine is a super fun, quick romance that will brighten your day. It may not quite reach the pure magic that was The Hating Game, but it’s still entertaining and cute. Great review! It’s a bummer that the plot isn’t quite as good as The Hating Game, but I’m glad it’s still good!